P’kolino, designer of fun and safe furniture and toys for kids, including the delightful Klick Puzzle Chair, recently teamed up with Spain based Jovi, a world leader in art supplies, to bring a new line of non-toxic art materials to the U.S. market. All of these P’kolino Art Supplies have been made especially with kids in mind — featuring playful and unique larger shapes that are easier for small hands to hold. These art supplies also clean up in a snap, are long-lasting and affordable. See the bright collection of P’kolino Art Supplies after the jump! 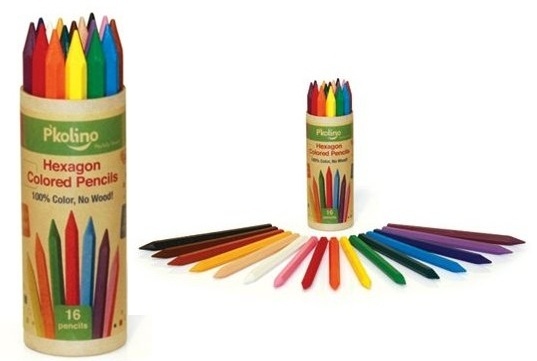 P’kolino Triangle Crayons: Non-toxic, proprietary materials that are shaped in an ergonomic triangular shape that’s easy to hold and prevents crayons from rolling away. No messy or excess paper wrappers to deal with, bright fun colors and superior durability make these premium crayons a hit. Available in packs of 12. P’kolino Hexagon Colored Pencils: Made of 100% color so your artist child can use the whole pencil. Since there’s no wood they are super easy to sharpen, yet durable. Pencils are also smooth to the touch and won’t leave color on hands. 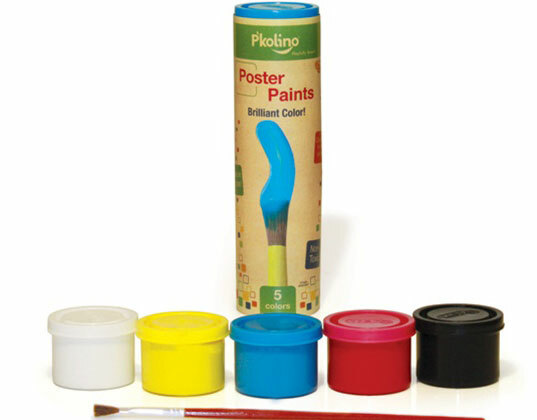 P’kolino Poster Paints or P’kolino Finger Paints: Both paints are non-toxic, water-based, washable paints. Spreads easily and provides great coverage. Packed in resealable containers. Available in a packs of 5 brilliantly playful colors — and the poster paints also come with a paint brush. P’kolino Colorful Markers: Made with low odor, non-toxic, food dye inks that produce long lasting vivid colors. Markers glide easily on paper and have durable depression resistant tips. P’kolino Playful Art Set: If you can’t choose just one set, the perfectly playful set is the answer. This set comes with 12 Colorful Markers, 12 Triangle Crayons, and 16 Hexagon Colored Pencils. P'kolino, designer of fun and safe furniture and toys for kids, including the delightful Klick Puzzle Chair, recently teamed up with Spain based Jovi, a world leader in art supplies, to bring a new line of non-toxic art materials to the U.S. market. All of these P�kolino Art Supplies have been made especially with kids in mind -- featuring playful and unique larger shapes that are easier for small hands to hold. These art supplies also clean up in a snap, are long-lasting and affordable. See the bright collection of P�kolino Art Supplies after the jump!